Full Gospel Tabernacle – Let's Go RVing! Today was a very slow day. 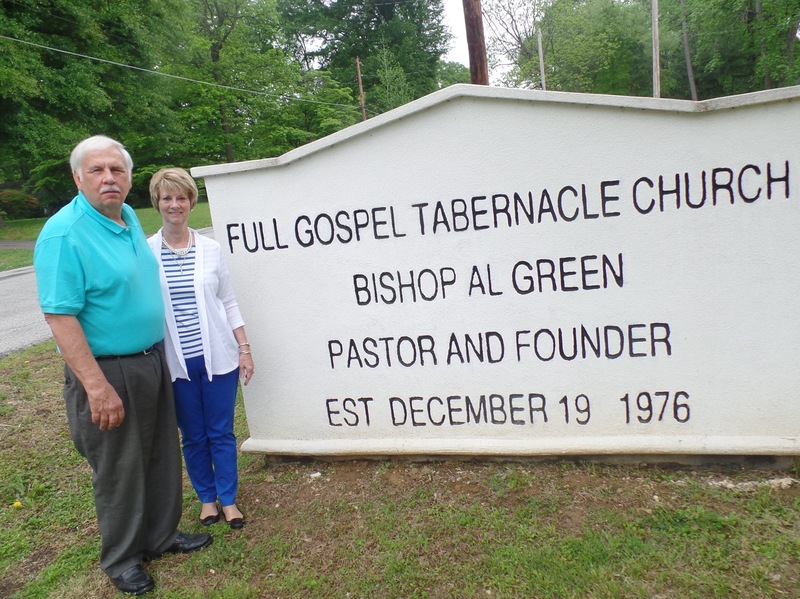 We were planning to attend church at the Full Gospel Tabernacle with Bishop Al Greene and their service didn’t start until 11:30 so we had a very slow morning. Jerry had trouble sleeping last night because he was coughing so after being up for a while he went back to the bedroom and took a little nap. I spent the morning working on the computer. He came out and asked if was time to get ready for church. I had no idea. I will be glad when we get back on EST because I stay confused about time. Apparently he is too because we got ready and left for the church which is only about 15 minutes from the campground and it was only 10:40. When we got there there were some people taking pictures in front of the sign so we walked over and asked them to take a picture of the two of us. They did and then we all walked in. We could tell that something was going on in the sanctuary but were told to go on in so we did. Apparently it was Sunday School. That lasted about 30 minutes and then people began to file in for church. We moved and sat in the middle so we could hear and see better. Hearing was not a problem though because it was very loud. It was a typical black church with a lot of shouting, repetitious singing of songs for the most part I didn’t know. It was nice though. The pianist was a guy from Nashville, Johnny Henderson and boy could he play! All of the musicians were outstanding. They had a baptism of two young boys. Finally about 12:30 Bishop Greene came out and sang and quoted scripture for a while. Then they took up the collection. I had never seen it done like that before. Each person got up and took their gifts to the altar. Actually that is scriptural. After that a number of people, mostly guests I would assume left and then Bishop Greene preached a brief sermon. He talked about gossiping. We finally left about 1:45 – a whole lot of preaching going on! So glad we were able to visit the church and hear Bishop Greene. His life is a real testimony and Folks, we went to church today and heard the Word of God preached! We came back to the motor home for lunch and to decide what to do for the afternoon. The weather wasn’t good, cloudy and dreary, and most things that we wanted to visit closed at either 4:00 or 5:00 so we didn’t have much choice. Since we were out of the travel forms for the Travel Log that I keep for specifics of each trip we went to Office Depot and Jerry got 50 copies. That makes 100! I guess he’s really planning on us traveling a lot! Then we rode over to Adams Street where we’d been told there were several Victorian homes. I think there were about four – they were pretty but due to the late hour we couldn’t visit any of them. Then we rode down to see the Bass Pro Shop Pyramid and try to take some pictures of it. I’m not very good at that. We did find out that it is opening on Wednesday, two days after we leave. Guess we’ll just have to come back! We rode on over to Tom Sawyer Campground in Arkansas to see what that looked like. Actually it wasn’t that impressive. I guess that’s because we live on the Pamlico River. Not many days when you can visit Mississippi, Tennessee and Arkansas all in the matter of an hour! On the way back Jerry tried to help me get a picture of the Welcome to Mississippi sign. Again, I’m not very good plus the camera stalls between each picture. We came back to the campground and sat outside for a while but it was just too cool so we came in. Tried to FaceTime with the kids but that wasn’t successful. Trent and family were out for dinner and David and Eli had such a poor connection we couldn’t visit. After dinner I spent some time organizing all of the brochures we have accumulated through our travels. I had bought some manila envelopes at Office Depot so now everything is sorted and filed. I’ll probably never be able to find anything! It’s only a bit after 8:00 but we’re both sleepy.